Snowy Owls are true denizens of the far north, and are only occasionally found south of the Canadian border — even in winter. These beautiful pure white owls are widely admired for their beauty, but not well understood. Project Snowstorm is changing all that by tracking “snowies” using GPS units to find out more about where they go, how and what they hunt, and more about their lifestyle. When there is a scarcity of the voles and rodents they typically eat, this triggers an “irruption” of these birds which means they fly far south out of their normal winter habitats north of the US border to find food. Every few years, or sometimes more often, they are forced make their way down to the lower 48 states to places which are atypical for them in winter – sometimes as far south as Texas or Florida. 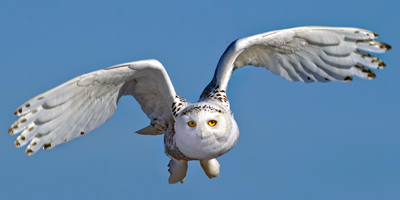 Scientists working on Project Snowstorm are learning a lot from the owls they are tracking. For example, they now know that that Snowy Owls which have flown south during an irruptive year, will fly out over water and perch on buoys or platforms, to hunt sleeping ducks at night. They can even pinpoint the buoys on which the birds perch to hunt and can determine what they are eating as a result. This is a fascinating project and gives scientists and the rest of us the chance to learn more about this somewhat enigmatic bird. Take a look at some of the birds Project Snowstorm is following, and learn more about what they are doing. There may be one near you, and you can have the chance to see a fabulous “snowy” in person! 3 – Never, ever feed a Snowy Owl!